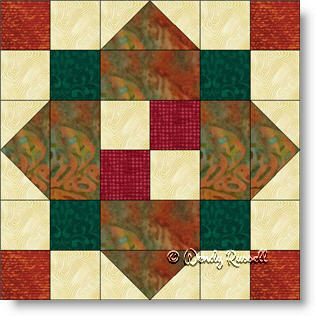 The 9 Patch Square - Variation quilt block is built on the Nine Patch Square -- a logical assumption. The difference between the two blocks is that the centre in the Variation version has a four patch unit rather than a single square. In any case, both quilt blocks are effective as evidenced by the illustrated quilts. No difficult patches to make -- just colour choices can make all the difference in the end result.